Teflon coated hook up wire is used in a variety of general-purpose electrical applications. Stranded silver plated copper wire provides good electrical connectivity. The Extruded Polytetrafluoroethylene (PTFE) insulation allows for use in high temperature electronic applications, and protects the wire against abrasion, chemicals, oils, and solvents. It also has excellent thermal aging, solder damage, flame, and moisture resistance. The wire conforms to MIL-spec specifications, and provides excellent uniformity for easy processing, stripping, and terminating. Kit includes Black, Blue, Green, Red, White, & Yellow. View More In Gear Stock & Pinion Wire. 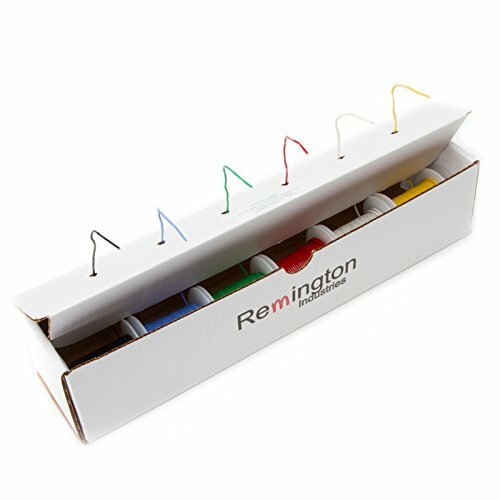 If you have any questions about this product by Remington Industries, contact us by completing and submitting the form below. If you are looking for a specif part number, please include it with your message.